For most of the history of television, the barrier to syndication—and to profitability—has been 100 episodes. The shows that have made it to that mark are an unusual group. Many were big hits. Some found small cult audiences. Still others just hung on as best they could and never posted numbers quite low enough to be canceled. In 100 Episodes, we examine the shows that made it to that number, considering both how they advanced and reflected the medium and what contributed to their popularity. This entry covers Mister Ed, which ran for six seasons and 143 episodes in syndication and on CBS between 1961 and 1966. In the 1950s and ’60s, Americans started leaving the city for the country, and television followed suit. The medium served as a new homestead for the likes of The Lone Ranger and Gene Autry from its earliest days, but the “adult Western” double whammy of Gunsmoke and The Life And Legend Of Wyatt Earp gave TV its first real taste of manifest destiny. The year those shows debuted, a cowboy couldn’t crack the Nielsen Top 30. Five years later, at the start of the new decade, four of the five most popular shows in the United States were horse operas. The fifth of those shows would signal the next phase in TV’s rural exodus. Led by the folksy talent who stormed onto the big screen in Elia Kazan’s A Face In The Crowd, The Andy Griffith Show made primetime fixtures out of backwater burgs like Mayberry, North Carolina. Itself a spin-off of another juggernaut from Desilu Productions, The Danny Thomas Show, the expanding boundaries of Andy Griffith’s fictional setting eventually established a pastoral empire for its studio, encompassing Mayberry R.F.D. and the offsite military exploits of Gomer Pyle, U.S.M.C. Meanwhile, rival independent production outfit Filmways was firing up its own assembly line of exurban comedies, introducing (in succession) Mister Ed, The Beverly Hillbillies, Petticoat Junction, and Green Acres. Though they curried little favor with Emmy voters—who were, at the very least, smitten with Don Knotts’ portrayal of bumbling Mayberry deputy Barney Fife—Andy Griffith and The Beverly Hillbillies went on to become the two biggest sitcoms of the decade, building a reputation for homespun comedy on CBS that earned the network a tongue-in-cheek sobriquet: The Country Broadcasting System. United by a sense of place, Desilu’s and Filmways’ rural comedies diverged in their senses of humor. While Sheriff Andy Taylor and his country kin played things earnest and grounded, the Filmways house style was more surreal—and none of those shows was as surreal as Mister Ed. Green Acres came close, but by then, Batman had made self-aware camp all the rage. In putting a straight face on the weekly adventures of an architect (Alan Young) and his talking horse (the gelding Bamboo Harvester, voiced by character actor Allan “Rocky” Lane), Mister Ed blended Mayberry earnestness with Filmways’ flair for the bizarre. It’s one thing to have a smaller animal like Green Acres’ Arnold Ziffel traipsing through a scene, but it’s quite another to have a great, muscular beast like Bamboo Harvester at the center of a series. Adding to the series’ surreal look, Ed had a full wardrobe of novelty-sized hats and glasses; in “Leo Durocher Meets Mister Ed,” the show produced one of the strangest visual gags in TV history when “Ed” “slides” into home plate at Dodger Stadium. Viewed one way, it’s just a chintzy effect in a series that’s usually more careful about that kind of thing. Viewed another way: It appears that the producers, having given up on beating a dead horse, are now dragging its carcass down the third-base line. When Wilbur Post (Young) and his blushing bride Carol (Connie Hines) move in to the house at 17230 Valley Spring, the country chic of the era is splashed all over the living room. The front doors have the diagonal bracing of a barn entrance, and a repurposed barrel serves as an end table in the living room. But like the midcentury modern fixtures mixed in to the Posts’ rural getaway, Mister Ed existed at the intersection of two prevailing ’60s trends. Similar to The Beverly Hillbillies, Mister Ed debuted at the dawn of the high-concept sitcom, a gimmick-happy era where comedies weren’t just looking to the farm for inspiration—they were gazing at the stars and paging through storybooks, too. A format born in realistic, domestic spaces like the ones depicted on I Love Lucy, The Honeymooners, Mama, and The Goldbergs was brought to fanciful new heights through advances in filming and editing techniques, allowing for the high-stakes spy-movie hijinks of Get Smart, the super-powered house guests of I Dream Of Jeannie and My Favorite Martian, or the castaway crises of Gilligan’s Island. At their best, high concept sitcoms wound their gimmicks around the frameworks of a less-involved production, like Bewitched, the story of two newlyweds—one of whom happens to be a witch. At their worst, they’re kitschy, ready-made punchlines, like My Mother The Car or The Flying Nun. Somewhere between the wicked smarts of Bewitched and the running-on-empty premise of My Mother The Car, there’s Mister Ed. (Though it’s worth noting that in television, even the most creatively bankrupt concept can forge some major talents: My Mother The Car is the show that brought together the creators of The Mary Tyler Moore Show, Allan Burns and James L. Brooks.) Essentially a TV adaptation of Arthur Lubin’s Francis The Talking Mule franchise, the series reinvents a premise laid out in a series of short stories by Walter R. Brooks: Milquetoast architect Wilbur Post (“Wilbur Pope” in Brooks’ stories) finds himself the owner and lone confidant of a mischievous talking horse named Ed. As had happened with Max Shulman’s Dobie Gillis stories when they were brought to CBS, Lubin would have to do some sanitizing to get Ed ready for primetime. On the page, Wilbur and Ed are carousing drunks, their walkabouts often spurred by the cocktail parties thrown by Wilbur’s socialite wife, Carlotta. Ed’s trickster streak survived the translation to the screen, but the booze and the bawdiness were pitched for milder family-hour fare. On TV, Ed’s habits never got nastier than eavesdropping on telephone conversations. The networks, however, balked at the show’s creaky, unfunny pilot. Sponsors were reluctant to sign on as well, until the agency representing the series drafted on a bit of pioneer spirit. 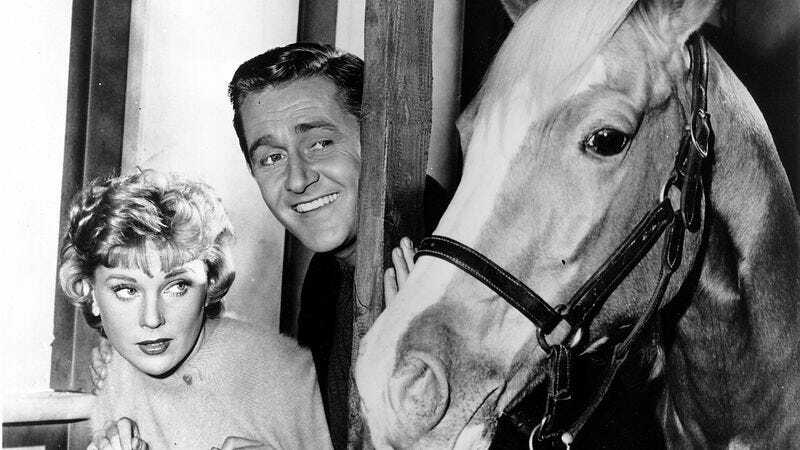 Having booked the role of Wilbur following a complete, post-pilot overhaul (Lubin and company replaced everything but the horse’s voice), Alan Young was sent on a barnstorming mission to sell Studebaker dealers on the idea of sponsoring what was originally titled Wilbur Pope And Mister Ed. The new casting came down to a personal recommendation from Burns: As Young would later tell it, the cigar-chomping co-star of The George Burns And Gracie Allen Show said, “I think we should get Alan Young because he looks like the sort of guy a horse would talk to.” Enough of the car peddlers agreed, and they put up the money to syndicate the first year of Mister Ed. When the Studebaker money ran out, CBS stepped in, seeking a series to pair with Lassie. The network would have its pony show and its dog show leading into Ed Sullivan’s powerhouse dog-and-pony show on Sunday nights. “It was the idiot sitcom era, dominated by those kind of shows,” Must See TV architect Warren Littlefield said, reflecting on the era of Mister Ed for The New York Times. “We were not a society big on relevance at that point. There was a feeling that television was a place to get away from it all, and attempts at doing more relevant stuff failed quickly.” Textually, the tumult of the 1960s was largely confined to Walter Cronkite’s sliver of the broadcast day; subtextually, it found a way to slip in the back door through the very sitcoms Littlefield decries. In its depiction of a wife who literally has more power than her husband, there’s a potent streak of feminism coursing through Bewitched. The Addams Family and The Munsters refract the eternal struggle of squares-versus-heads through their central families of weirdos and the ostensibly “normal” people spooked by their ways of life. And in Wilbur Post, Mister Ed presents an alternative to the man in the gray flannel suit. That’s something of a holdover from Brooks’ original stories: Both Wilburs are iconoclasts, working creative jobs (sometimes the literary Wilbur is an architect, sometimes he’s an ad man) and carrying on conversations with a horse. Of course, Mister Ed isn’t a radical program by the standards of any era. But by putting Wilbur in opposition to stuffed shirts like Roger Addison (Larry Keating) and Gordon “The Colonel” Kirkwood (Leon Ames), the show demonstrated that there was more than one way to grow up. The chatty Palomino was always going to give the show kiddie appeal, but those kids could also see something of themselves in Wilbur Post and the man playing him. There’s a zest to Young’s performance that maintains the live-action-cartoon feel of Mister Ed, and it’s little wonder that the actor found a second career in the recording booth, giving voice to a smattering of Smurfs, a pair of Battle Of The Planets characters, and Scrooge McDuck. While Mister Ed had plenty of fun with a horse who thinks he’s people, it also made a joke out of the opposite scenario. In season four’s “Wilbur Post, Honorary Horse,” Wilbur’s imagination runs away with the idea that he’s growing too close to Ed. Addison, the Colonel, and their shared skepticism toward Wilbur represent the old guard that was on its way out, the men who won the bread during the day, asked not to be disturbed while reading the paper at night, and unwound through adult pursuits like golf and gardening. Wilbur may have taken a wife and a job, but he never completely put away childish things. Mister Ed made sure of that: The show lampshades its high-concept when Ed declares Wilbur the only human he finds worthy of conversation, though he’s occasionally seen speaking to children. (Putting a lampshade on a lampshade: “Who would believe a kid saying a horse can talk?”) The differences between Wilbur, Addison (or “old sourpuss” as Ed likes to call him), and the Colonel have a lot to do with that. Though hardly the type of man-child who fronts so many contemporary sitcoms, Wilbur’s habits and preoccupations still run counter to those of the men around him. Though he does abide by one convention of the day: The upstanding master of Post Manor has taken a bride, and is seen carrying her across the threshold of their new home in the series premiere. It’s the closest they’d ever be—at least on camera. In her role as a stock 1960s sitcom wife, Carol drives stories with spending habits and unaccountable emotions, flimsy characteristics that already looked ancient thanks to Wilma Flintstone and Betty Rubble. (On her spending expeditions with Addison’s wife, Carol always appears three seconds away from bellowing “Charrrrrrge it!”) The Posts’ marriage may be at the center of Mister Ed, but it’s not the show’s central relationship. That belongs to Wilbur and Ed. As Wilbur, Young took on one of the most demanding lead roles in the history of TV comedy, a position that required his presence in almost every scene of import in every episode of the series. And though his scenes with Ed may come across as solo performances, they were actually the results of a four-way collaboration: Between Young, Bamboo Harvester, horse trainer Lester Hilton, and voice actor Allan “Rocky” Lane. A staple of the B-Western circuit, Lane’s career trended downward with the decline of the genre, and he happened to be staying with Hilton when the producers were casting Ed’s voice. (As Young tells it, Lane booked the gig with a perfectly Ed-like display of houseguest brusqueness: “Hey Lester, where’d’ya keep the coffee?”) If there’s a hint of the personal in Ed’s distaste for Westerns, that’s probably the source—though the producers of Mister Ed hardly treated him any better. Out of wounded pride, the actor initially declined a credit for playing the type of animal he used to ride on camera; by the time he’d come around on the concept, it was Lubin and Al Simon who declined to give Lane the credit, citing young viewers’ belief that Bamboo Harvester was doing the talking himself. “So they gave him a raise and he was happy,” Young told the Archive Of American Television. Mister Ed avoided its own ignoble sunsetting, being put out to pasture before the “rural purge” of 1971. At least there were noble intentions behind the mass cancellations: Calls for wider representation in primetime following the civil rights movement, spelling the end of absurdly white depictions of rural America. Born in syndication, Mister Ed would find a second life with local affiliates and specialty broadcasters, becoming such a staple of rerun lineups that its theme song heralds “Weird Al” Yankovic’s entrance into UHF’s namesake TV outpost. The “idiot sitcoms,” as Warren Littlefield called them, would have remarkable staying power. Shows like Mister Ed play better in reruns because they’re not deflated by punchlines that used to be topical, but now aren’t. A talking horse is a talking horse, of course, of course, no matter the decade. As he always did, Mister Ed gets the last word.